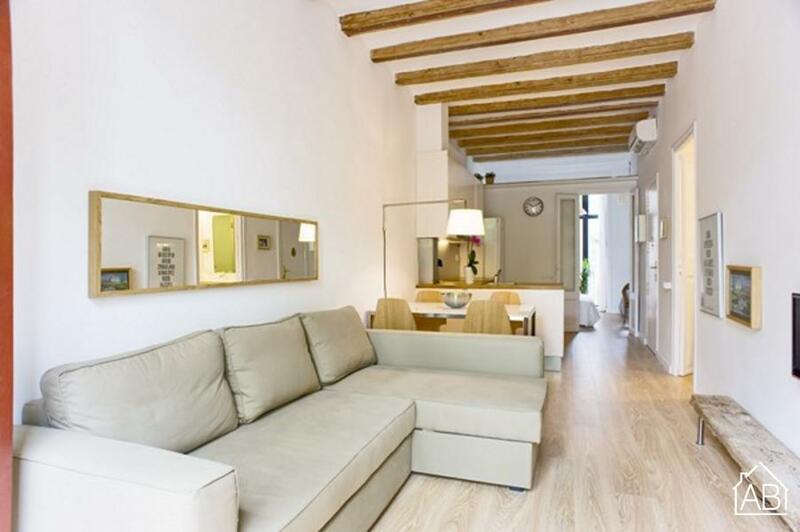 Situated in the beautiful Gràcia, this two-bedroom apartment in Barcelona is a great choice for your trip to the Catalan capital. The neighborhood is the most distinctive Catalan area in the city, ensuring that you experience all of the rich culture in Barcelona, first hand. The central location and easy access to public transportation allows you to explore all that Gaudí´s city has to offer! The apartment enjoys a simplistic design, with traditional touches throughout adding to the warm feel of this lovely residence. A neutral color design, exposed ceiling beams and parquet flooring further add to the ambience of this ideal home-away-from-home. The living room is furnished with a comfy single sofa bed, and a TV. The apartment also has a balcony where you can soak up some Spanish sun as you look out over this beautiful Barcelona ´ barrio´. And for those who need to get in touch with friends and family back home, rest assured, an Internet connection is also available. The modern kitchen is fully equipped with all of the utensils and appliances needed to create your very own home-cooked meals, or even to try your hand at some Mediterranean inspired-dishes! The main bedroom has a double bed, while the second room is furnished with two single beds, meaning that this apartment can accommodate up to five people in total. The residence has one bathroom, fitted with a walk-in shower. This beautiful Barcelona apartment, complete with heaters and air-conditioning, is the ideal choice for those who seek a comfortable stay during your trip to Gaudí´s city!